1-2-3 Ocarina Teacher is designed to help any teacher deliver effective music lessons. 1-2-3 Ocarina Teacher supports note-by-note ocarina-teaching and step-by-step learning of note names and note values at the same time. The 64 page A4 book has practical ideas to incorporate percussion and other instruments too. Guitar chords are included, along with piano accompaniments and two CDs. 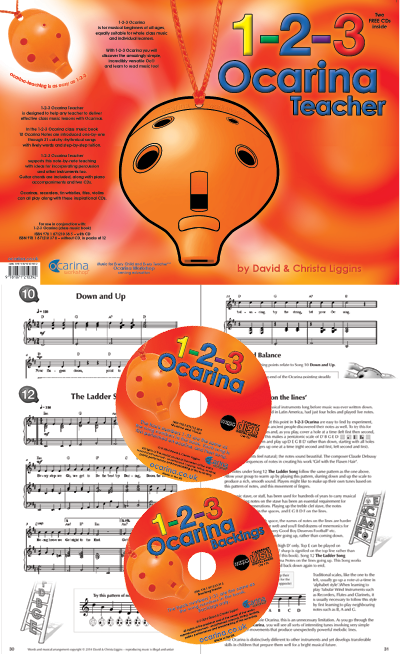 Ocarinas, recorders, tin whistles, fifes, violins, ukuleles and guitars can all play along with these inspirational CDs, reading from the new class music book 1-2-3 Ocarina. This book will support any teacher, whether they feel “musical” or not.